Ever since the Compact Disc was introduced to American audiences in 1983, music enthusiasts have consistently demanded bigger and better advancements in sound quality and technology while engineers and manufacturers have clamored to meet their demands. At the forefront of many of the music industrys hi-tech breakthroughs, Pioneer has now set out to revolutionize the DJ industry with the introduction of the worlds first true digital turntable, the CDJ-1000. Karl Detken and Brian Buonassissi of Pioneers marketing department recently hosted a party at New Yorks Centro-Fly, at which they introduced the CDJ-1000 both to the press and to the general public. After a brief rundown of the CDJs innovative features, National Skratch Champion and remix artist, DJ Roonie G, first demonstrated the players parallels to an analog table, and then broke into a rousing freestyle session complete with old-school tricks like skratching behind his back, through his legs, and even with his nose. Next up was Pioneer endorsee, Grammy nominee and producer extraordinaire, Roger Sanchez, who adeptly demonstrated the players versatility in a 10-minute exhibition set. After the doors were opened to the public, Pioneers premier national demonstrator, DJ Hot Toddy, served up a 45-minute mainstream mix before turning the digital tables over to DJ Roonie G who gave them another fierce workout. Roger Sanchez then stepped up to the plate to finish off the evening (and the crowd) with his own unique style of high energy house music. The concept of a digital turntable has been around for a while, and some manufacturers (including Pioneer) currently have models on the market. According to Buonassissi, though, they are all just cheap imitations which have actually turned off many vinyl DJs from converting over. Boasting the worlds largest touch sensitive jog dial (7 diameter), which allows an ultra crisp brake and release, the CDJ-1000 is heralded by Pioneer as the first digital turntable that truly emulates its analog cousin. Other advancements include Wave Display which reads each track on the CD and displays the sound level graphically, an Internal or Removable Multimedia Memory Card (MMC) for storing cue, loop, wave and CD information, and Loop In/Out Adjust which allows the DJ to adjust both the in and out points of a loop stored in memory. Upgraded sampling capability, improved pitch blend, and increased tempo control range also contribute to the CDJ-1000s remarkable appeal. Vinyl-loving DJs who have thus far resisted the lure of digital technology no longer have any excuse for excluding CDs from their repertoire. Pioneers CDJ-1000 may be a bit pricey at $1,150, but can you really afford to live without one? 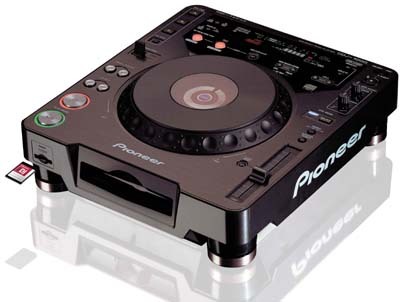 For more information on the Pioneer CDJ-1000, please visit www.pioneerprodj.com.